I finally sold the beater! This past Saturday, I finally sold my beater. It's been a long time coming, but I finally saved enough cash for a better used car a few weeks ago. 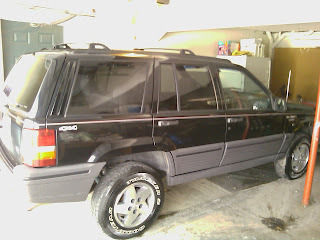 Then, with about 4 hours of work, I was able to get my 15 year-old Jeep Grand Cherokee cleaned up and sold over the weekend. This past summer, I wrote a guest post on the ChristianPF.com blog entitled When should you replace your old car? In the post, I mentioned the numerous, expensive repairs I had made to my Jeep in 2009 and the decision I was facing on whether or not to keep the vehicle. I decided to keep it going for the short-term and then save money like crazy to buy a "newer," more dependable vehicle. During the fall and early winter, I was able to accomplish this goal. I'll write about this purchase in my next post. OK, so I had a newer car and I needed to get rid of the Jeep. I spent about four weeks debating what I should do with it. I considered giving it away to charity, because I really wasn't sure how much life was left in the car. In the end, though, I opted for a quick sale on Craigslist in order get some cash out of the vehicle. Here was my process and timeline for selling the vehicle. 20 Minutes - I took the Jeep over to our local drive-thru car wash, and purchased the most expensive wash they had in order to make the exterior look as good as possible. 60 Minutes - I spent an hour cleaning up the interior. I cleaned the inside glass with spray cleaner, cleaned the dash and instrument panel, threw away all trash, and vacuumed out the car. The interior of the vehicle had issues, but I attempted to make it as clean as I could for a quick sale. 10 Minutes - I went to CarFax.com and purchased a car fax report in order to offer it in the sale of the vehicle. 10 Minutes - I took 4 medium resolution, digital pictures and downloaded them to my computer. If you want to sell anything fast on Craigslist, you have to take good pictures! I'm not sure about you, but when I search for items for purchase, I skip all the ads that don't have any pictures of the item advertised. Do you need a beater to get you through while you're digging out of debt? You can have mine! I just paid cash for my next car and moved up to something better. I have it priced low to sell fast. I'd like it out of my garage. Recent repairs and work include: newer battery, newer tires, new plugs and wires, new 4-wheel drive transfer case w/warranty, new valve spring, and new headliner. I've tried to take care of this vehicle and running well. With the 4-wheel drive, it's been running great in these recent snow storms. It's a 15-year-old car with 215,000 miles so it has issues, but I don't think you'll find a better car at this price. Come check it out. I have old repair receipts and a CarFax report for you to look over. The first person with $900 CASH walks away with the Jeep. 80 Minutes - I posted my article to Craigslist, and within 3 minutes, I received my first caller. He was at my house within 30 minutes. Then he spent some time looking over the car and test-driving the vehicle. He made an offer of $750 and I took it because I just wanted the vehicle out of my garage. We filled out the paperwork and he drove it away. Not bad for an afternoon of work! If you want to get rid of a used car that's in pretty decent shape, Craigslist is definitely the way to go. In fact, after accepting my first phone call, I ended up receiving about 8-10 phone messages shortly after of people extremely interested. Before my buyer even arrived, I went ahead and deleted my posting because I didn't want to be receiving and returning phone calls for the remainder of the afternoon! Do you have a story about selling a car on Craigslist? How fast was the process for you? Was your experience as quick as mine? I love this story, and the fact that you used Dave in your ad. He would be proud! Sounds like both you and the buyer got a deal. Thanks, Kacie. I'm sure I wasn't the first person to come up with this idea, but I'll take the credit!